On this page you will find the club rules, membership fees and how to apply for membership of Darlington Fly Fishers Club. DFFC offers exclusive fishing on prime beats of the River Tees and the River Greta. We are a small, friendly club limited to 40 rods. 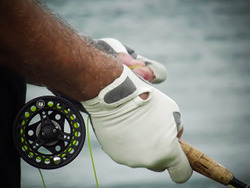 Our members enjoy exclusive fishing in secluded, scenic locations. Brown trout of up to 5lbs have been caught and there exists the possibility of catching a migratory fish. The grayling fishing is also excellent. The cost of annual membership is £135. Existing members must pay their subscription on or before 31st January. New members are welcome to join at any time if there is a vacancy. Please view / download the DFFC Application Form. Complete and return the form to the secretary at the address shown on the form. Payment can be by cheque or electronic transfer. Fully paid up members are welcome to bring a guest by arrangement with the Secretary. A member can purchase a day ticket for his / her guest from the Treasurer for £5s. Prospective new members can have a complimentary trial day when accompanied by a sponsor. The following dates apply to fishing on our waters. Trout: 16th April - 30th September. Salmon and Sea Trout: 1st Feb - 31st Oct.
Grayling: 16th June - 14th March. Every member must complete and return a catch return form at the end of the season.